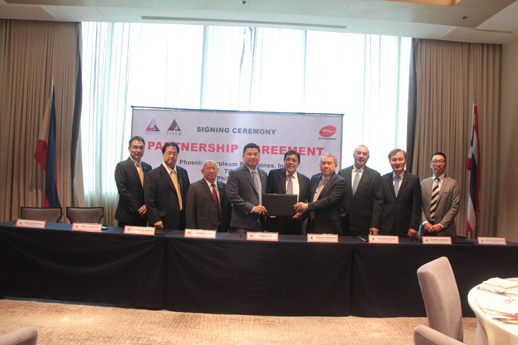 Phoenix Petroleum Philippines, Inc. has entered into a joint venture agreement with TIPCO Asphalt Public Company, Limited (TIPCO Asphalt) of Thailand and Carlito B. Castrillo of PhilAsphalt (Dev’t) Corporation (PhilAsphalt) – expanding its portfolio to include bitumen and bitumen-related products. Phoenix Petroleum President and CEO Dennis Uy (4th from left), PhilAsphalt President Carlito Castrillo (center), and TIPCO Public Asphalt CEO Somchit Sertthin (4th from right) lead the contract signing on January 16, 2018 at the Shangri-La at the Fort, Manila. They are joined by, from left, Phoenix Petroleum COO Bong Fadullon, Vice Chairman Romy de Guzman, Chairman Domingo Uy, TIPCO Public Asphalt Executive Director Jacques Pastor, Managing Director Chaiwat Srivalwat, and PhilAsphalt Vice President Jose Paulo Castrillo. The joint venture will operate, market, and distribute bitumen and bitumen-related products in the Philippines. The deal is part of Phoenix Petroleum’s strategic focus to create growth and opportunities in highly attractive industries and markets that are complementary to its core fuel business and are underpinned by strong macroeconomic fundamentals. As bitumen is one of the by-products of crude oil refining, Phoenix is effectively expanding its portfolio of petroleum products. TIPCO Asphalt is the leading manufacturer and distributor of asphalt products for repairing, maintenance and servicing and construction of road pavements, highways and airport runways in Thailand and the Asia-Pacific region. Its asphalt products are also sold to importers and road contractors in Africa, Australia, and North America. acquisition of Philippine Family Mart.